Use this iron-on, nonwoven interlining to add shape and dimension to your next project! This unique leather-like product is easy to shape and tear resistant making it ideal for hats, bags/purses, belts, crafting and home-dec projects. FUSE to your favorite decorative, cotton or synthetic fabric and create a dimensionally stable yet flexible piece that will give body without bulk! The fusible adhesive on Deco-Magic� creates a permanent bond to the fabric but because the adhesive is needle-friendly you are free to embellish with your favorite decorative stitches! Be sure to visit our projects page for creative ideas on how to use this magic product! Available in regular and light-weight versions. 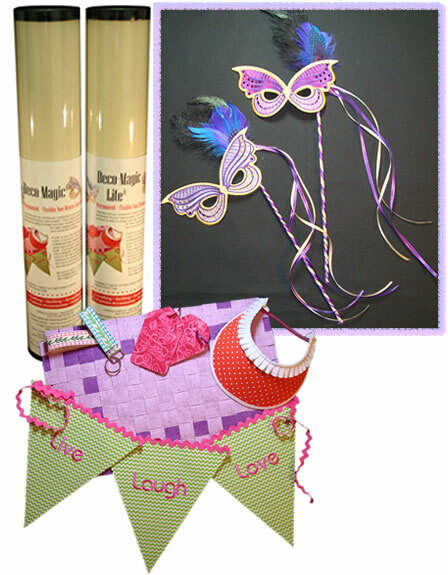 Use for crafting, quilting, scrap-booking, fashion accessories and home d�cor. Sewing is optional � heat will seal the bond � even through laundering! This flexible leather-like interlining gives firm shape to most fabrics! Needle Friendly � stitch for hours with no gummy needles! Create 3-dimensional appliqu�s to accessorize belts, hats, bags and purses. Easy to shape and tear resistant for unique embellishments! Use the regular weight version to create roll up game-boards for travel, paper dolls, costume accessories and more for your little ones! *Optional - Preparing the fabric to which Deco-Magic� will be applied is a very important step. It is recommended to pre-wash fabrics if at all possible to remove any sizing or starch used in the manufacturing process which may adversely affect the bond. Do not use fabric softener or dryer sheets when laundering. Pre-laundering will also remove any shrinkage and this will aid in producing the most beautiful and durable finish possible. Place the fusible side of Deco-Magic� to wrong side of the fabric. Pressing from the fabric side - Fuse Deco-Magic� to the fabric using a medium/high temperature on the iron (No Steam). Hold the iron in place for at least 3 seconds to set the bond. Let the piece completely cool. Cut or trim to your desired shape or size. If desired, finish by stitching around the shape with your favorite decorative stitch. **NOTE: All irons heat differently. The iron temperature given above is a starting point. If you find that you are not getting a good fuse, slowly increase your irons temperature until you achieve a good bond. **Test all fabric for bonding capability before beginning your project.